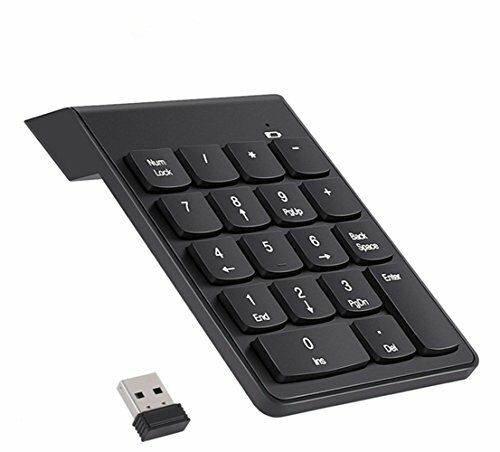 kokome USB Numeric Keypad 18 Keys Wireless USB Number Pad Keyboard with 2.4G Mini USB Numeric Receiver for Laptop Desktop PC Notebook by Kokome at Pacs BG. MPN: FBA-KWA0069. Hurry! Limited time offer. Offer valid only while supplies last. Considerate design for comfortLow profile, Quiet soft-touch, Gently-curved key design for all-day comfort for demanding keyboard interaction. Low profile, Quiet soft-touch, Gently-curved key design for all-day comfort for demanding keyboard interaction. Anti-skidding foot pad make every operation enongh firm and stable, non-slip. 1.Open the rear cover of the keyboard, install one AAA battery(Not included the package, Note the positive and negative directions), The red light will be lit and then extinguish. 2.At the meantime, pls kindly remove the receiver,Insert it to the device's USB interface, and then computer will install the driver automatically, Finally, you can use this Numeric Keypad. Compact size: 18-key wireless numeric keypad. Hibernation mode enabled automatically, no power button needed. Effective Range:Up to 10m working range.Operating frequency: 2.4 G technology. Battery operated: an AAA battery£¨not included£©for the keypad to work. If you have any questions about this product by Kokome, contact us by completing and submitting the form below. If you are looking for a specif part number, please include it with your message.